Take a look at this. This man insists that Hemp (Marijuana) OIL is a cure for cancer, along with many other conditions. Very interesting! Cannabis Cures Cancer - "Run From The Cure"
Under an Obama Administration, just like 1960's all over again! Take a look at this article, a black reporter and Reverend was hauled away from the scene forcibly. She wanted to give a letter to the President and had Press credentials. Be for warned, this will happen more and more. Obama doesn't care about rights of the Press, or about your rights, only his right to control your lives. Come on, put the facts of the last 100 days together folks! Maryland's idiotic Socialist Governor and Annapolis Democrats have raised taxes enough that 1/3 of our Millionaires have left the state. The only way to increase revenues are to CUT TAXES! One-third of the millionaires have disappeared from Maryland tax rolls. In 2008 roughly 3,000 million-dollar income tax returns were filed by the end of April. This year there were 2,000, which the state comptroller's office concedes is a "substantial decline." On those missing returns, the government collects 6.25% of nothing. Instead of the state coffers gaining the extra $106 million the politicians predicted, millionaires paid $100 million less in taxes than they did last year -- even at higher rates. "Is Barack Obama Crazy?" is a pretty provocative subject for an email. I admit, I don't know the answer to the question. But, given Barack Obama's actions in the first few months of his administration, it's a valid question. And so, the May issue of WorldNetDaily's acclaimed monthly Whistleblower magazine takes it on. If you held a job and people were questioning your qualifications, and all you had to do to put an end to those questions, not to mention more than a dozen lawsuits filed against you, was to produce a valid birth certificate you claimed to possess, would you refuse to take that simple step? Or would you, as Obama has done, spend at least $1 million to fight the lawsuits? I think most people would agree that someone who chose the latter is either crazy or doesn't have a valid birth certificate. Let's say you got a job in which you succeeded someone with whom you disagreed passionately.Would you try to have that person prosecuted over those differences, knowing that some day, someone with whom you disagree would succeed you and possibly contemplate the same course of action? That's what Obama talked about doing in the case of his disagreement with George W. Bush over the practice of coercive interrogations – policies, I might point out, that were employed not just by his immediate predecessor, but by every war-time president in the history of the United States. Or what do you make of Obama's efforts to ban the use of the words "terror" and "terrorism" from his administration's lexicon? The administration prefers to call attacks on terrorists "overseas contingency operations." And terrorist attacks at home are referred to as "man-caused disasters." These new terms are apparently considered less offensive to terrorists. While there are hundreds of thousands of U.S. citizens voluntarily serving in arms overseas, the Obama administration put out a report to law enforcement agencies throughout the country to be wary of returning veterans, because they might be more inclined to get involved in "right-wing extremist" activities. Obama presides – legitimately or illegitimately – over a nation founded on the ideals of "independence" and "national sovereignty." Yet, in a speech given in Prague, what was his prescription for making the world a better place? "All nations must come together to build a stronger, global regime," he said. How about his solution to an economic crisis spurred by too much indebtedness? More debt. Let's say you're the first black president. Do you appoint a black attorney general who indicts the people who just elected you as a "nation of cowards" on matters of race? Imagine appointing to a top policy position at the Defense Department, a columnist from the Los Angeles Times who believes U.S. policies were to blame for the 9/11 attacks by al-Qaida. That would be Rosa Brooks, who also previously referred to Obama's immediate predecessor as "our torturer in chief " and a "psychotic who need(s) treatment" while comparing Bush's arguments for waging a war on terrorism to Adolf Hitler's use of political propaganda. I don't know if any of these actions mean the president is crazy. But I do know they mean he is dangerous to the security and prosperity of the nation. WWE Kane is a Really Smart Dude! 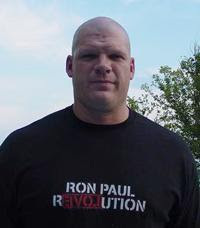 Glenn Jacobs, better known as Kane on WWE Pro Wrestling, is one smart dude! One of my favorite on air personalities, he also seems to be one of my favorite conservatives! Glenn posted a great lesson on economics in March, on Lew Rockwell. Glenn, maybe you should run for office! Where can I send the money for your campaign? See more posts from Glenn on his Blog, named Adventures of Citizen X. Gotta love that name too! This Blogger is Stunned - Obama for Military Tribunals! Yes, I am truly stunned. Obama reversed some of his anti war rhetoric this past week, and spoke out FOR Military Tribunals, to be held in Guantanimo Bay. I myself think this is a very good thing. I must admit, it is one thing I like from a slew of things I dislike. But I am glad to see Obama has an opinion other than his political base. He has a very long way to go to the middle, but this is progress. Again - Bailout Money Does NOT Save Chrysler! More wasted money from American taxpayers. Chrysler will be sold to FIAT! Looks like the bailout money also didn't save Chrysler from almost shutting down, and plants closing. Though the deal says no Chrysler workers will lose jobs, for how long? Eventually, the employees will be tossed out like Obama did to Taxpayer funds! So looks like Obama has helped give Chrysler to a foreign owner!